One of the cool things about coffee is that there are so many devices that you can use to make it. Being a true gadget fan, I’ve tried a number of them over the years. On a fundamental level, there are two ways of brewing coffee. The first is simply soaking the grounds in hot water, in much the same way as you make tea. 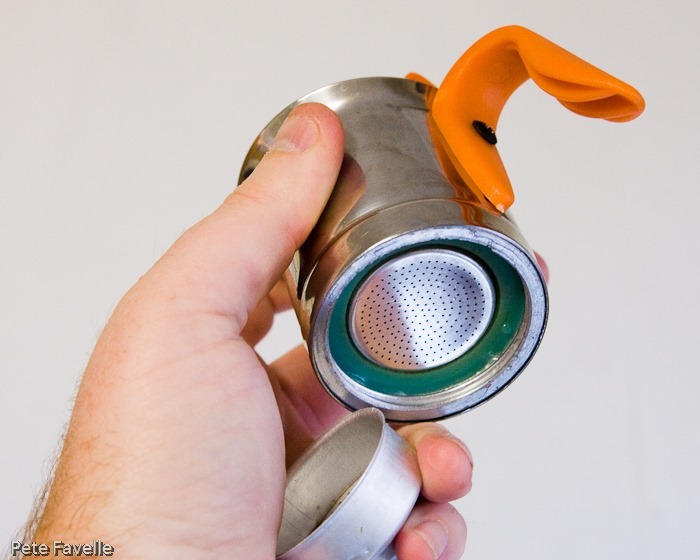 This is the principle on which things like cafetieres and drip filter machines work, although the exact mechanics vary. On a side note, this means that if you can’t find a kettle, a drip filter machine should make a perfectly decent cup of tea. The second approach actively forces hot water through the grounds under pressure. This process results in a more efficient extraction of coffee, which has two effects. Firstly, it enables you to make a short, espresso style shot instead of a ‘long’ coffee and secondly (and to my mind, far more importantly) it’s a lot quicker. This is how the Aeropress – my current gadget-du-jour – and the big fancy espresso machines work. 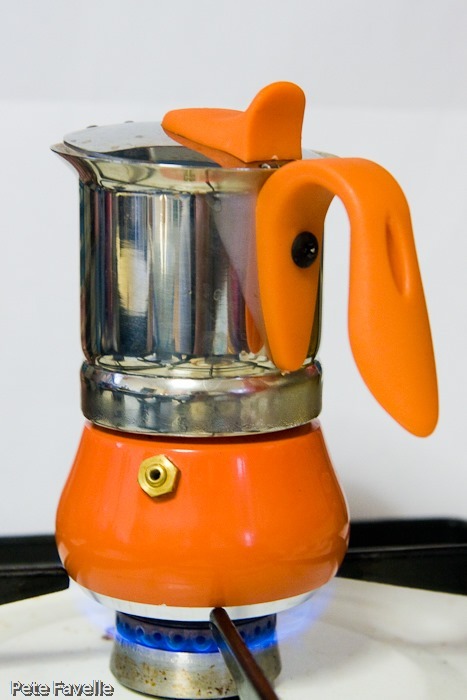 Perhaps one of the most iconic coffee makers is the “hexagonal stove top espresso thingie”, as I call it. Apparently it is more properly known as a moka pot. I’ve often thought they were wonderful looking devices, although I didn’t really know how they worked, so I was rather excited when Top Gourmet kindly offered me one to try out. As I’m the only proper coffee drinker in the house (the lovely Kavey prefers Tesco Value instant powder, I kid you not) the fact that this produces just single shot is fine – obviously larger sizes are also available. However, its small size also makes it a bit of a challenge using it on a gas hob. That’s our smallest ring, and the pot still sits directly on the flame, although you can get reducer rings if you prefer. Still, it seems to work fine without. So how does it work? 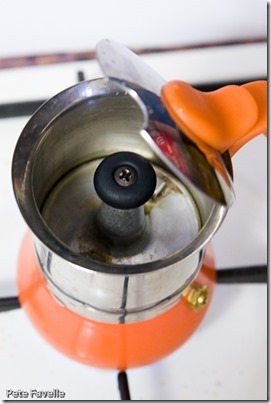 Well, there are three elements to a moka pot, two of which are visible when assembled. The first is the water reservoir, which is the orange tank at the bottom. As the name suggests, this needs to be filled with water. The second is the cup on top, which is where the coffee will end up. As this picture tries to show, in the middle of the cup is essentially a chimney, and the coffee will get pushed up through that chimney and flow down into the cup. Essentially, it’s a rudimentary one-way valve. The third component is the filter that holds the grounds themselves. 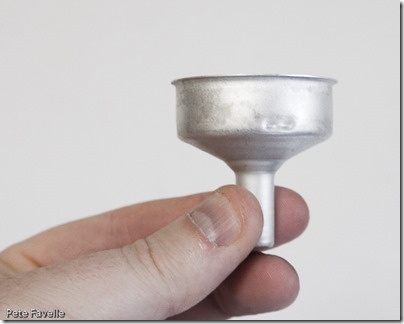 This is a funnel shaped and fits so that the narrow ‘spout’ of the funnel rests just above the base of the water tank. Once it’s all assembled, the water is heated to boiling point. The resulting steam builds up pressure in the water tank, which in turn forces water up through the funnel (i.e. in reverse from the normal way a funnel runs) and therefore through the coffee before rising all the way up into the cup. This is essentially a steam engine, making you a cup of coffee. How cool is that?! Ok, so this is all very interesting but what about the resulting coffee? Well, although not quite boiling, the water used to brew the coffee is quite a bit hotter than when using something like an Aeropress, so it results in a slightly more bitter drink – but it’s a marginal difference. It’s probably as quick as any other method, trivial to clean and, as you are boiling exactly the volume of water you require and no more, highly energy efficient. And it’s a cute looking thing, too. The only downside for me is that I don’t drink espresso – I drink what is variously called “cafe americano”, a long coffee or (as I would put it) “a mugful”. So once I’ve made my espresso, I still have to boil the kettle to add the hot water. As such, it’s more of a faff and it’s not likely to become my daily coffee machine. Personally, I find it ideal for making a lazy latte – an espresso from the Steam Engine and a mug of milk nuked in the microwave. Just as good as your local barista’s finest, and without all that annoying froth nonsense on top. A beer should have a head on it, a coffee shouldn’t. 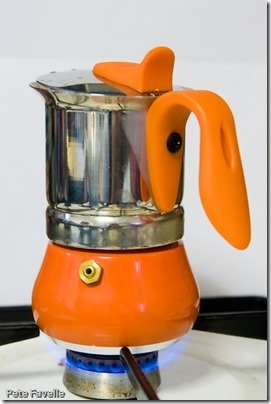 Many thanks to Top Gourmet for providing the GAT Winner Stove Top Espresso Pot.